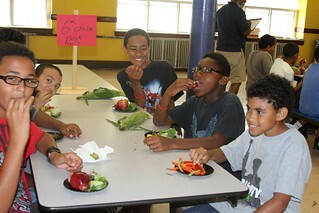 Fruit and Vegetable Ambassadors (F&V Ambassador) students of Slater Jr. High School in Pawtucket, RI sample fresh fruit and vegetables at a Pawtucket Summer Food Service Program on July 26, 2012. The students at this summer food program earned their nickname as the “F&V Ambassadors” because these students have the adventurous spirit to try new and different fruits and vegetables. The students have the added responsibility of encouraging fellow students throughout the school year to make healthier decisions at lunchtime. The U.S. Department of Agriculture’s (USDA) Food Nutrition Service (FNS) encourages school districts to promote healthier eating.